The lecture describes the development of a Chinese Buddhist mantra attributed to the meditation master Pu'an (1115-1169). 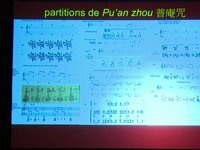 The text and music of this work, the mantra of Pu'an, are in evidence since the sixteenth century and are today part of many diverse repertoires, that of monks, farmers, scholars, notables and professional musicians . First transmitted in the temples, the Mantra was integrated in the instrumental repertoire of the imperial court of the Qing Emperor Kangxi and played by the Emperor himself. Analysis of the distribution of the Mantra of Pu'an contradicts the idea of it's diffusion being a single broadcast channel, whether from scholars to the people or the court to the people. Autonomous spheres of music of the people, the court and scholars do not exist in China. The conference is organized on the occasion of the publication of the book by Mr. Picard, "L'incantation du patriarch Pu'an", in the collection of Chinese and Buddhist mixtures, published by I'IBHEC. After studying theater and Sinology in Paris and at Shanghai Conservatory of Music, François Picard sustained his doctorate in 1991 under the direction of Iannis Xenakis and then worked as a producer at Radio France. Since 1998 he is professor of analytical ethnomusicology at Paris Sorbonne University. Member of various scientific societies, he is notably Senior Visiting Fellow at the International Institute for Asian Studies in Leiden. He served as Artistic Director for over thirty musical albums. He plays several Chinese wind instruments and directs the ensemble Fleur de Prunus.